Since becoming a grown-up, there are many things about childhood I remember fondly. One thing I was happy to forget about forever was allergies. For several years during my early life, growing up in mostly in Colorado and Michigan, I had the pleasure of getting allergy shots each week, rotating arms because it took about a week for the pain to subside in the other arm from the previous week’s shot. These shots, hassles that they were, made it so I could play soccer without the fallout of wheezing at night from the effects of rag weed and other irritants on my airways. Later on, I was gratefully allergy-free for years living in the Pacific Northwest and Alaska. Check this out: honey has anti-microbial properties and has for centuries been used for medicinal purposes of all sorts, including as a dressing for serious wounds. It’s also high in antioxidants and tastes real good on cereals, in sauces, lemonade and all kinds of stuff. 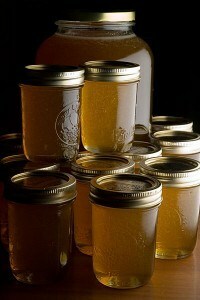 The most interesting use I’ve ever heard of for honey is as a natural remedy for seasonal allergies. According to various natural health practitioners, pollen found in locally-grown raw honey works over time to desensitize the body to allergens much like traditional allergy shots. It’s working for me. Each and every season since I first started using it in fresh, homemade lemonade and teas so far has been allergy-free, even amidst rumblings from pals that it is unseasonably allergy-ish. I would like to thank the local apiaries for selling multiple varieties of the stuff – it has saved my sanity and makes summer completely enjoyable. Thanks, all you bees and beekeepers out there for a multitude of reasons! Previous Post Specialization is for insects.